This big family six tried hard to take the fight up to Holden and Ford. The Australian auto industry in 1957 provides a clue as to what faces the world at the end of the current economic crisis. Global observers are predicting that as few as five automotive entities will survive the so-called global meltdown. After Australia’s tough import and currency restrictions from 1945 culled vehicle choice and availability, the outcome might provide some insight into how the world automotive landscape might look in a decade’s time. The unexpected fallout from these moves was to ultimately increase choice, not restrict it. Even after the Button car plan tried to rein these choices in again during the 1980s, the outcome today is one of the most varied markets in the world despite Australia’s relatively small population. 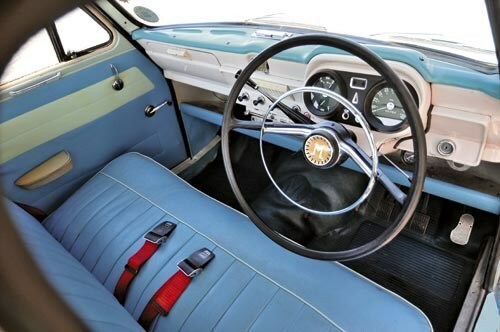 The 1957 Morris Marshal is a reminder of what happens when choice is artificially restricted and models adapted to suit such controlled market conditions. New players simply fill the gaps created by the surviving makers after they have rationalised their model ranges. The context of the Marshal, which was totally unique to Australia and the first six-cylinder family car tailored to take on Holden dominance, starts with the local dependence on British currency, the concentration of rural buyers and the growth in size of US vehicles to the point where they were no longer suited to Australian requirements. It’s a recurring theme globally that has finally brought the US industry to its knees. Just as Ford, Chrysler, Datsun and Toyota exploited these gaps after the British industry failed in Australia, so did the Koreans take up the slack in the early-’90s following the loss of Australia’s small car industry. The Morris Marshal and its Austin A95 Westminster twin, along with a similar range of local Dodges, DeSotos and Plymouths based on a re-badged Plymouth design which disappeared around the same time, is a fascinating case study of why badge engineering has been constantly rejected. Prior to 1945, a range of Nuffield badges including Morris, Wolseley, MG and Riley had loyal local niche buyer bases and a dealer network independent of mass market Austin, which was the British equivalent of Ford. After 1945, Nuffield was heavily influenced by Alec Issigonis, as his revolutionary Morris Minor design fed into other models. Although Riley and MG initially evolved from pre-war 1939 designs, the Morris and Wolseley ranges quickly exploited the styling and mechanical layout proven in the Minor. All were compromised by primitive ’30s engines. Limited funds meant that the range-topping six cylinder Morris and Wolseley models shared the rear section of the smaller four-cylinder Oxford mated to the same longer, taller bonnet that housed the bigger engine. The less said about the engine, which dropped its valves at indecently short intervals, the better. It was a ploy later exploited by Humber. The extended bonnets not only made these mongrel models look like they were bending at the windscreen, they treated their occupants no better than their much cheaper four-cylinder stablemates. Fast forward to 1952 when Austin and the Nuffield Group merged into the British Motor Corporation. The theory as always was to amortise costs by sharing more parts over a wider selection of models while retaining each marque’s loyal buyer group. The theory falls apart as soon as the bean counters lose sight of what made each marque special to its own buyer group. In the case of BMC, it started a firestorm that killed off the entire independent British industry after Leyland added fresh fuel to the inferno in the 1970s. British Leyland ensured that every significant mass-produced marque from Jaguar to Rover along with the entire BMC stable was lost to their British owners. The same process is well under way with GM in the US with Oldsmobile the first post-1945 casualty and Pontiac looking precarious, even if its offshore divisions are in much better health than Leyland’s ever were. From 1952, Austin contributed a new range of overhead valve engines so desperately needed by the Nuffield marques. While Austin’s A-series engine shared between the baby Austin A30 and Morris Minor could do little to dilute the fundamental differences between the two cars, the B-series engine later shared across mid-sized Austin, MG, Morris, Wolseley and Riley models quickly led to several near-identical ranges wearing different grilles and trim. At the premium six-cylinder end, it was no different but the death of the big Morris Isis and Riley Pathfinder along with the terminal evolution of the big Wolseleys into rebadged Austins was both cynical and doomed. The Australian Morris Marshal previewed what would soon follow in the UK. In 1954, the relatively popular Morris Oxford evolved from a super-sized Morris Minor into the dumpy, if not unpleasant, Morris Oxford Series II powered by the B-series Austin engine. 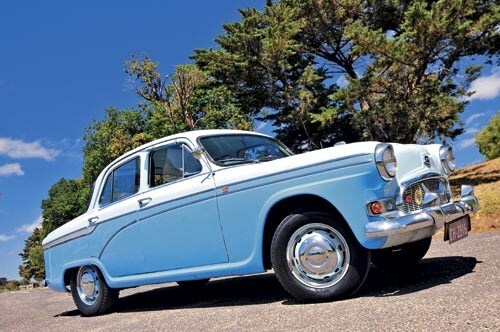 Its rack and pinion steering and torsion bar front suspension at least provided a different driving experience to the Austin A50 Cambridge with the same engine under the bonnet. Where the Oxford would feed the worst of Australian roads into the cabin as the driver enjoyed its agility, the Cambridge’s barge-like feel shielded the passengers from road shock in much the same way as an early Holden did. Add the massive C-series six-cylinder engine to the equation and these differences became blurred. Contrary to what many believe, the C-series which powered the big Austin-Healeys, was a Morris engine and first powered two Nuffield models, the Wolseley 6/90 and Morris Isis in 1954. 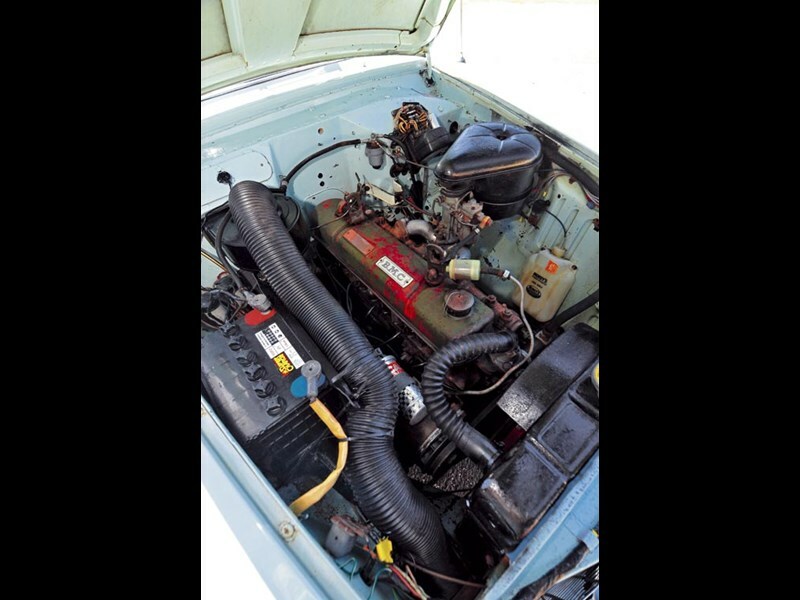 Although the C-series shared the B-series four-cylinder stroke, timing chain, sprockets and cover, the camshaft was on the opposite side and featured typical Morris features such as SU carburetors, solid little end bearings and a proper timing chain tensioner. Austin engineers hated it when the cylinder head bolts passed though the inlet manifold. As the big Wolseley 6/90 was now closer to a Riley than a Morris and its powerful new 2.6-litre engine was a welcome change from its fragile predecessor, the 6/90 survived while the stretched-Oxford origins of the Isis caused sales to stall. Austin meanwhile exploited the new engine in the all new A90 Westminster. Although the A90 Westminster shared its doors with the A50 Cambridge, it was bigger in all dimensions and looked better than its cheaper sibling, not worse. A fresh new identity and its prestige feel took the battle to its Vauxhall Velox and Ford Zephyr rivals. A string of global competition victories and endurance feats ensured that the Westminster sold up to five times better than the Isis, something that wasn’t lost to the Australian BMC operation which placed it into local production. The facelifted A95 version added extra bling and by sliding the rear axle further along the springs, its wheelbase was boosted to the same as the first Chrysler Valiant. It was a big and fast car by Australian standards, slotting perfectly between the FE Holden and the unique Australian Ford Customline of 1957. Because this left the local Nuffield network without a strong six-cylinder contender against the Holden onslaught, the Isis was replaced with a Morris-badged bench seat version of the local A95; hence the arrival of the Marshal. The Marshal was 20 percent dearer than a Holden, around 10 percent more than the stylish new Zephyr Mark II or about the same as the four cylinder Standard Vanguard. Local Marshal detailing, which was cleaner than the Westminster and featured a boomerang in the grille, had a strong Morris flavor backed up by what was originally a Morris engine under the bonnet. The only jarring note was Austin’s Zenith carburetor although the four speed manual gearbox was unmatched at the time. 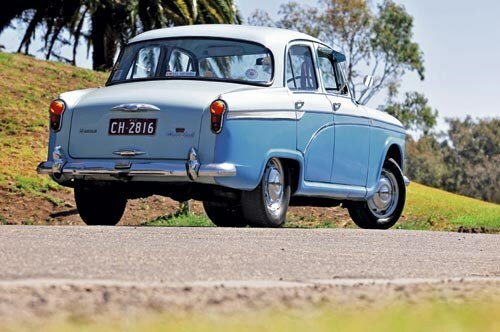 By the end of 1957, Morris was on a roll, outselling Austin in Australia by around 40 percent, making it the third biggest seller behind Holden and Ford; a far cry from when Austin was Australia’s biggest seller just before the first Holden came on stream. Although the Mini would give Morris a second wind in Australia before Leyland destroyed the marque in the 1970s, the local Marshal and Major marked a halcyon period for Morris when it had every market segment covered by popular models including light commercials. Although 1341 Marshal sedans were produced along with just 54 Traveller wagons and 30 panel vans, most have succumbed to rust or had their engine bays plundered to keep an Austin-Healey alive. As for the wider Australian market, the Marshal was soon forgotten when a string of worthy alternatives including the Toyota Crown, Rambler American, and Chrysler Valiant, quickly filled the gap. 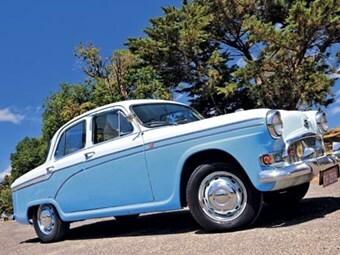 Ford and Holden simply added local Futura and Premier models. Just watch the same process happen all over again globally if GM or Chrysler are forced to close their doors. Shayne Martin was like many Australians in the 1950s whose family didn’t own a car. His grandfather though, bought a new Morris Marshal in 1958 and would allow a young Shayne to sit up high on the centre rear armrest, and he was hooked for life. Shayne found his original unrestored example with barely 65,000km on it in 1992. He has since collected an exhaustive range of Marshal memorabilia and purchased the original number plates of his grandfather’s Marshal even if the car itself is long gone. When so few Marshals survive Australia-wide, Shayne is keen to maintain a register before they are lost. Shayne also owns a rare 1952 Morris J van and several Marina coupes including the rare six cylinder version.